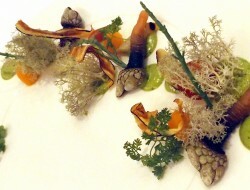 Ride4RealFood: Reporting From A Food Security Fundraiser - Good Food RevolutionGood Food Revolution | Wine is food. Harvest cake supplied by Alli Fresh Baked. On Sunday, September 13th, 2015, Torontonians participated in the annual Ride4RealFood, a charitable bicycle ride dedicated to supporting local food security. Participating riders spent the morning exploring key changes in Ontario’s farmland through three different cycling routes, all of which convened at McVean Farm in Brampton. Rise4RealFood riders take a minute to catch their breath at McVean Farm before partaking of the picnic feast. Once there, riders as well as key community partners working on food security initiatives enjoyed a fantastic picnic catered by Parkdale’s West End Food Co-op and supplied by the following food partners: Field Sparrow Farms and Beretta for fantastic chicken, hamburgers, and sausages; Mister Produce and Bizjak Farms for fresh produce; Jax Coco, Natur-a, and Kiju Organic for refreshing beverages; and Yummy Stuff, The Tempered Room, Dufflet, Cobs Bread, and Alli Fresh Baked for delicious baked goods. Although the rain could have dampened the event in more ways than one, everyone enjoyed their meals. Live music and laughter brightened up the sullen weather and enriched the convivial atmosphere of the picnic. But why the picnic, and why Ride4RealFood? 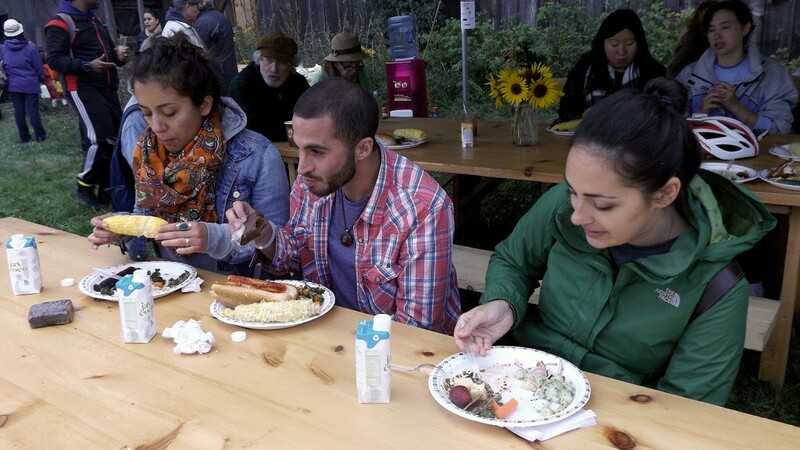 Beyond the beauty of a diverse community convening to share a delicious, healthy meal together, the event was organized to raise funds for a local food security program: Co-op Cred. Co-op Cred, which is managed by the Parkdale Activity-Recreation Centre (PARC), provides marginalized, low-income, and food insecure residents of Parkdale access to food credit at the West End Food Co-op for nourishing, organic food – a commodity that would otherwise be inaccessible. 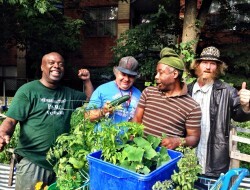 This is done through participants’ own voluntary labour, including as urban farmers in Greenest City’s gardens, cooks at the West End Food Co-op, and educators in the Parkdale Community Health Centre’s diabetes awareness program. Participants are identified through the PARC Ambassador community leadership program to take on these voluntary placements, and are further supported through training and learning initiatives. Beyond giving participants the opportunity to lead healthier, more engaged lives, Co-op Cred has had incredible effects on the greater Parkdale community, and will continue to do so through 2016. 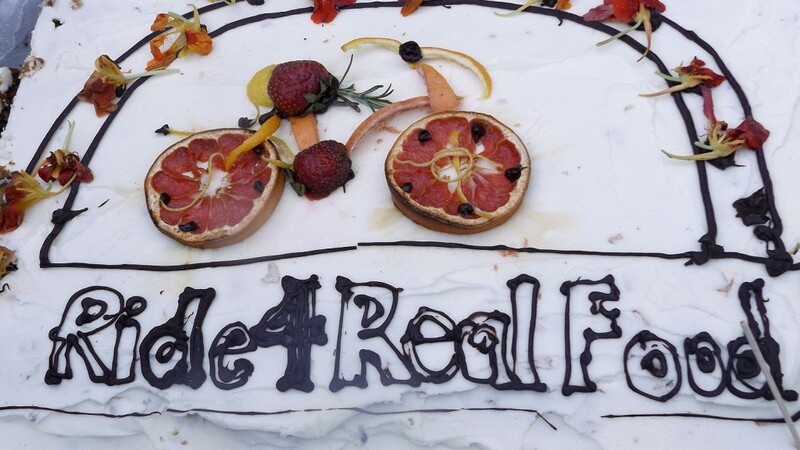 That is, this year’s Ride4RealFood raised more than $30,000 – enough to support over 30 Co-op Cred placements, and thus 30 individuals’ access to nourishing food for a full year. Although the cycling event and picnic have concluded, donations to the Co-op Cred program are open until September 30th – hopefully Ride4RealFood’s goal of raising $60,000 for Co-op Cred is still possible! While Good Food Revolution has profiled Co-op Cred in the past, we recently had the opportunity to talk directly with three of the program’s participants, Ann Lapenna, Amy Ness, and Eugene Hennie, about their experiences in the program. 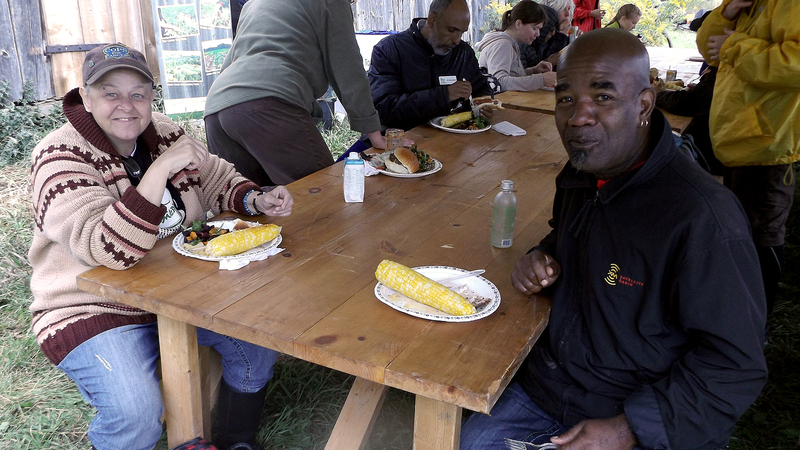 Ann Lapenna (left), a Co-op Cred participant, and “Junior” Harold Villafana (right), a PARC Ambassador, enjoy the healthy, delicious offerings at Ride4RealFood’s picnic. 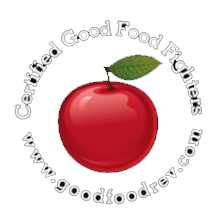 Good Food Revolution: How did you hear about the Co-op Cred program? Why did you make the decision to become a participant? Ann Lapenna: I heard about the Co-op Cred program through Bob Rose, a senior PARC manager. He was talking to me about the program and I said I would like to try it out. 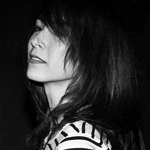 Amy Ness: I actually did not know about its fruition until Bob Rose invited me to take part. I decided it would enrich my life and help me with health issues. I have severe digestive issues and I knew that becoming a member would help me to obtain fresh, organic food! Eugene Hennie: I heard about the Co-op Cred program during the first PARC Ambassador meeting I attended back in March 2013. I made the decision to become a part of this program because I saw this tremendous opportunity to gain access to fresh, healthy, organic food instead of going to the food bank. GFR: What does it mean to be a PARC Ambassador? AL: To me, a PARC Ambassador means rebuilding lives, bringing the community into PARC, and PARC out into the community by working together. We all share different lives, only on different levels, and we need to bring this together. AN: Wow! That’s a loaded question! It encompasses a wide range of facets. To me, it means that I am representing the Parkdale community as a community leader, shedding some light on issues like oppression, poverty, mental health, and food shortage. These issues are near and dear to my heart – I am a survivor of the psychiatric system and also a strong advocate against psychiatric assault on spirited women who are seen as threats, violent, or “different.” I see myself as a victim of violence (psychiatric assault and social bullying and intimidation/discrimination) as well as a victim of poverty and oppression. EH: To be a PARC Ambassador is an excellent forum to be able to communicate an ongoing healthy dialogue with the public-at-large, educating them on what it means to be on the margins of society. 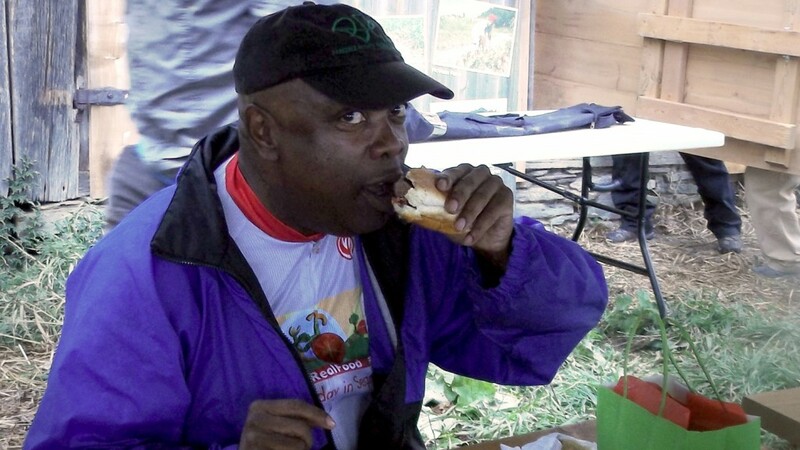 Eugene Hennie, a Co-op Cred participant, enjoys his meal after a long bicycle ride up to McVean Farm. GFR: What positive effects and changes have you witnessed in the Parkdale community since you joined the Co-op Cred program? AL: I believe that there are more people buying fresh food from the Sorauren Farmers’ Market and the West End Food Co-op. The grocery stores sometimes cost more than these markets, I think, and people want fresher foods. Plus, when I work in the market, I get to tell and share what I did that day with other people. AN: Positive effects? I see people caring more for themselves and this spreads out to others – it’s a fantastic ripple effect and consciously it brings awareness and a great sense of value among people in the community. It is good to see. 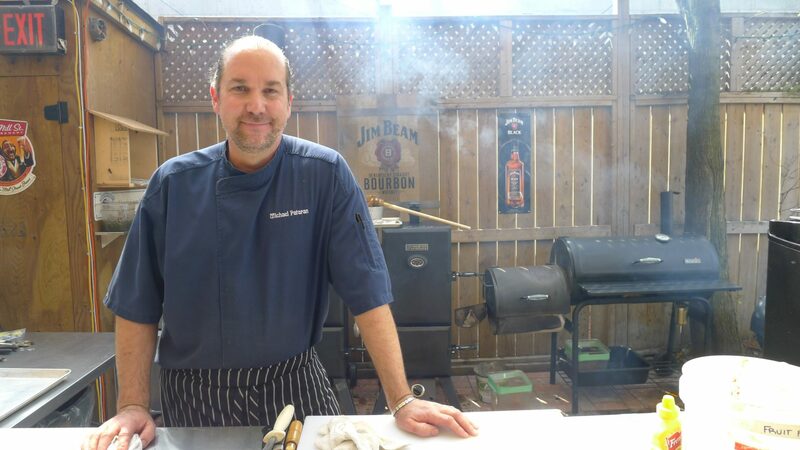 I think it brings out more appreciation for our lives – that is, that our lives matter down here in Parkdale! I see people smiling when they go to get their groceries after working hard for it and it’s a feeling of accomplishment! 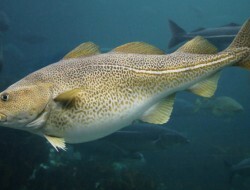 EH: Peoples’ lives and self-esteem altered, removing the stigma of isolation. Proceeding through life with renewed confidence and knowing that your life has some positive value. 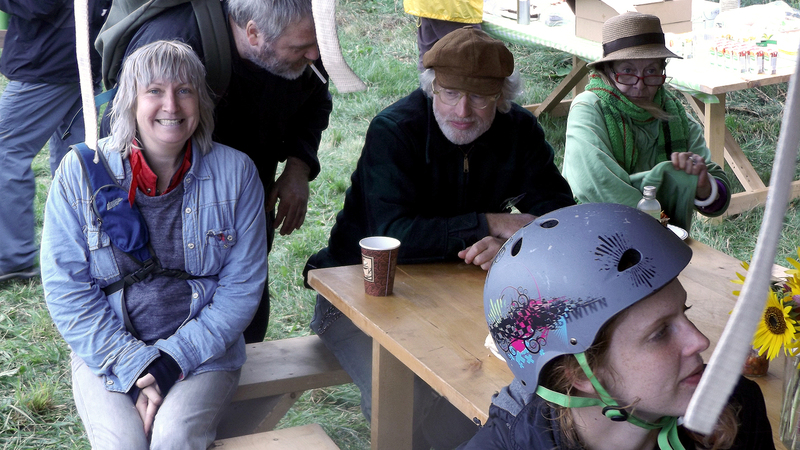 Amy Ness (far right), a Co-op Cred participant, is all smiles at Ride4RealFood. GFR: How has participating in Co-op Cred created positive change in your life? AN: Well for starters, my health is better; I love the fresh cheese, kale, and the variety of NUTS! And their Greek yogurt is scrummy! I am not just “scraping by” each month, and I can look forward to the second Wednesday of every month, which is Members’ Day at the West End Food Co-op, for groceries. I feel good about myself, I have more confidence, and I’m learning excellent, transferable skills that can be applicable to my resume. So that in-itself is a great help – when a possible employer asks me what I have done in the past two years, I have something to show for it. Plus, I was able to get my Reflexology Association of Canada certificate as a Registered Certified Reflexology Therapist. I’m hoping to start my own little business and the Co-op Cred program has given me the support and confidence to do this! It was a lot of work studying biology and anatomy, but well worth it! I have liability insurance and everything! I’m ready to go! And I have the PARC Ambassador program, Co-op Cred, and the West End Food Co-op to thank for that. Plus I’m starting to draw again! EH: It makes me eager to wake up in the mornings and face the challenges of the day, not feeling overwhelmed. GFR: Thanks so much for your time! Diana McNally is an educator and community worker developing the Co-op Cred program at the Parkdale Activity-Recreation Centre. She believes that access to healthy, affordable food is a fundamental right for everyone.